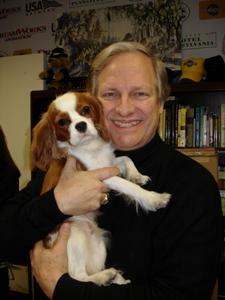 LoveToKnow spoke with David Frei to find out more about therapy dog training. One of the best known people in the purebred dog community, David is also very passionate and pro-active in his efforts to educate and expand therapy dog activities. David Frei is known to most people as the co-host of the Westminster Kennel Club Dog Show, and also The National Dog Show on Thanksgiving Day. He has enjoyed much success in the world of purebred dogs as a judge, as well as an owner, breeder and handler of Brittany Spaniels and Afghan Hounds. One of David's proudest accomplishments is the therapy dog certifications of his two Brittany Spaniels, Teigh and Belle. He has recently added another little smile-maker to his family. Her name is Angel, and she is a Cavalier King Charles Spaniel puppy. Angel recently received her therapy dog certification as well. David's dogs make weekly visits to bring comfort and happiness to pediatric patients and their families every week. In addition to his duties with Westminster Kennel Club, David founded Angel on a Leash. This is an independent 501c3 charity that supports the therapy dog program at the Morgan-Stanley Children's Hospital of New York-Presbyterian. Angel on a Leash has expanded its program to include the Ronald McDonald House of New York City, St. Jude's Children's Research Hospital in Memphis, Memorial Sloan Kettering Cancer Center in New York and Providence Health Care in Portland, OR. With so much experience in the area of therapy dog training, we could not think of a better person to inform our readers about this rewarding activity. David, what does a therapy dog do? Well, they can do almost anything. It begins with the basic principal that when a dog walks into a room, it changes the energy. A dog will make people stop and smile, and this helps people think about things other than the challenges they may be facing. This can be helpful to people in many circumstances, be it dealing with a health care situation or concentrating on the learning process such as working with the R.E.A.D program. 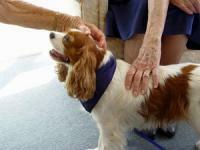 Therapy dogs and their human handlers create a caring atmosphere just by showing up for visits or other therapy work. People benefit greatly from knowing that others care for them; by simply coming in and saying "hello", you are letting people know that the dog cares, the handler cares and both are interested in helping others get through their difficulties. Which type of dog makes a good candidate for therapy work? I think it is a basic universal quality in all dogs that they care about people, and this is the most important quality a therapy dog can have. Certain breeds are inherently better suited for therapy work than others, but it can be any breed of dog or any mixed breed. Therapy dog work is largely dependent on good training. The situation that you put the dog in also plays a role. Some dogs may not enjoy being in a group of rowdy children, while another may equate this with being in heaven. If your dog prefers calmer surroundings, put him with a more sedate group such as seniors or people in hospitals that are not mobile and would enjoy a quiet cuddle with a calm dog. There is most likely a therapy activity for every kind of dog that enjoys being with people. That is the beauty of this activity. Which kind of training should a therapy dog receive? The training that is available to dogs and their owners through organizations such as Delta, Therapy Dog International or the Good Dog Foundation helps the dog with learning appropriate responses to people, working in situations that the dog does not normally encounter and getting used to noises and equipment that are commonly encountered in health care situations. It is also very important that the human part of the team receives training as well. The handler's main job will be to protect his or her dog. Proper training will allow handlers to know which types of situations can arise while working with their dog and how to properly handle those circumstances. When is a good time to begin therapy dog training? Formal therapy training should not begin much before a dog is one year old. They may not be certified before the age of one year, anyway. However, you may wish to take your dog to some basic obedience classes, and out for frequent walks such as going over to friend's homes or into stores that allow dogs so that the dog may interact with the public there. That is the most basic form of training, but you do not want to overload a young dog with too many experiences that he finds stressful. You want to assure the dog that these activities will always be fun, and not become too much work for him. Basically, getting obedience training and proper socialization lays a strong foundation for therapy dog work. How do a dog and handler become certified as a therapy team? David, thank you for sharing your knowledge of therapy dogs with us. You are welcome. One of the most important things we can do for dogs is spend time with them. Therapy dog activities are good for everyone involved!